Alexander Albon smacked into the wall at high speed after over-steering at the exit of Turn 16 with five minutes to go of FP3. 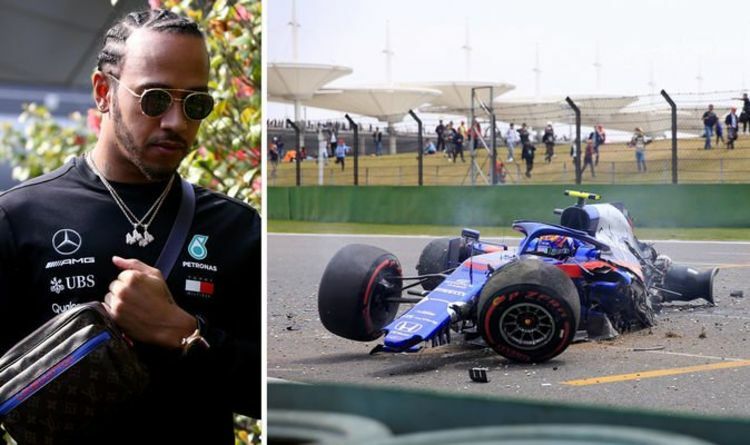 The Thai’s STR14 suffered massive damage and it is expected he will be absent from qualifying as a result, having been 9th fastest before the red flags. Albon fortunately clambered out of the car without any issues and apologised to his pit-wall. Toro Rosso team principal Franz Tost said of the crash: “We will see we investigate the monocoque and whether the car can be prepared for qualifying or not. “It’s the 1,000th grand prix – we can do it! That’s how far the development has come in 1,000 races. We have safe cars now. The session ending early meant Mercedes’ Bottas ended fastest with a time of 1:32.830. Behind him were the two Ferraris with Sebastian Vettel 0.392secs slower than the Finn and Charles Leclerc another two hundredths of a second back. Bottas’ Silver Arrows team-mate Hamilton was 0.849s behind him having struggled to get to grips with the soft tyres on his quicker laps. The Brit was also off the pace on Friday and will hope to step up a level in qualifying later today (7am UK time). But his former Mercedes team-mate Nico Rosberg expressed his concern for Hamilton’s chances of landing pole position in Shanghai. Sky Sports F1 pundit Rosberg said on commentary: ”I’m worried about Lewis. “He’s having one of his off starts to the weekend where he loses motivation. “He’s so far back, that I don’t think he’s going to have a shot at pole today. Bottas appears Mercedes’ best hope of securing first spot on the grid and continuing their strong record at this circuit. Mercedes have won five of the last seven races including four straight between 2014 and 2017 before Daniel Ricciardo’s success in the Red Bull last year. Hamilton is a five-time winner on the Shanghai International Circuit circuit with Vettel still seeking his first triumph here since 2009.